So you can imagine my excitement a few weeks ago when we moved & finally had a bath!! I immediatly hopped on amazon and ordered this massive bag of Dead Sea Salts for a bargain £4. I think next time I will try epsom salts or pink himalayan salts. I just want the saltiest bath possible. I also finally have a use for my Burt's Bees Lemon Bath & Body Oil (it was a bit too thick for a body oil in my opinion) it smells GORGEOUS and makes the water silky and my skin so soft (though I think the salt helps a lot too) It's quite expensive for the small size, and I always feel like I use a lot per bath... but it's not actually going down too quickly so we'll see how that goes. Ah, I am team bath, everytime! A shower is fine for the morning, but there is nothing like the ritual of a bath to relax and wind down in the evening. Team bath here, too. A few minutes (literally) in the morning and a nice long soak once or twice a week in the evening. 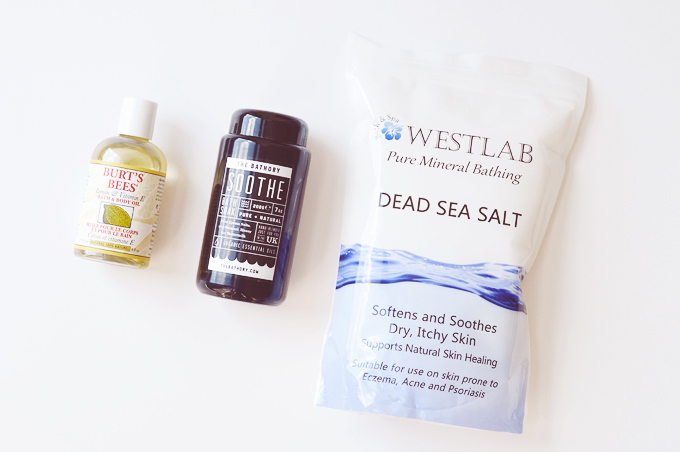 For the longer bath I use dead salt salts, ground oatmeal and whatever essential oils I'm in the mood for that day. The combination of the salts and the oatmeal leave my skin pretty soft and not in need of much moisturizing afterwards. I only take showers if I've put on a lot of sunscreen or am pretty grimy (i.e. covered in something I would prefer to rinse off right away and not to stew in). The soak sounds amazing! I love that it's custom. I'll admit I am a shower girl over baths, however there are a few times when I want to feel truely pampered so I hop into the bath. I def want to try some Epsom salts as I've heard such good things about them! I love bath salts, but at first I really didn't get how salt could be soothing for skin, seemed rather contradictory, but glad I caved!